With Coast’s commitment to quality, the G19 and HP3R Flashlights/Inspection Lights are impact resistant, weather resistant and their LED’s are virtually unbreakable. These Flashlights are both backed by Coast’s lifetime warranty against defects in materials and workmanship. Tested and rated to ANSI/FL1 standards. 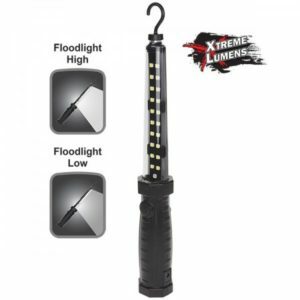 The Nightstick Xtreme Lumens™ Rechargeable Multi-Purpose LED Work Light is all about super-bright hands-free lighting. The floodlight has two brightness modes, high at 600 lumens and low at 225. The single push button body switch located on the handle controls all lighting modes. The NSR-2168 has three heavy-duty magnets built into the light, one at the tip one at the mid-point of the body and one built into the base for multiple hands-free uses. The flat-bottom design of the handle means the light will stand up on most flat surfaces, and the octagonal shape to the handle keeps the floodlight aimed in the correct direction when you lay the light on its side. 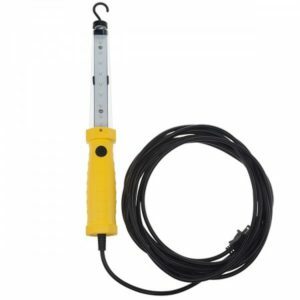 Further adding to the work light’s hands-free features is the detachable magnetic hook. It can be attached to either the body or tip magnets and can be rotated 360 degrees for even more hands-free versatility. The integrated Lithium-ion battery can be recharged with the included AC or DC power supply/charger. 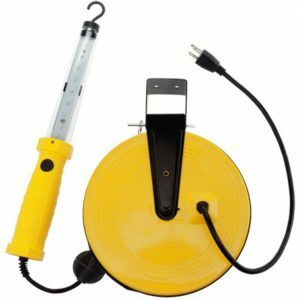 This lightweight and virtually indestructible corded all LED Work Light is quite possibly the brightest hand-held & hands-free work light available. Both the SL-2135 and SL-866 have two brightness modes of 1,200 Lumens on high and 600 Lumens on low. 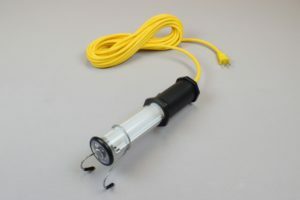 The light has a built-in magnet at the balance point in the middle of the handle and one at the tip of the light perfect for attaching the light wherever it’s needed. The octagonal shape of the handle keeps the floodlight aimed in the correct direction when you lay the light on its side. Includes a detachable magnetic hook that can be attached to either magnet on the body of the light.